I have started something called The Happiness Challenge with Glamour.com. And today the challenge hit Week 4. Here’s how it works: I have created a total of 5 Challenges. Each challenge is built around the idea that if you embrace all the best aspects of yourself and your life in a balanced way. The hope is, by the time you complete all 5 challenges—you will end up feeling stronger, more loving, more confident, more fulfilled and happier all-around. Next week is the final challenge—and the sweetest and the easiest of all. It’s not too late to join in, because there’s no such thing as being too late for happiness. Every single day, it’s up to us if we want to embrace a happy, fulfilled life in the small moments we face, minute after minute, hour after hour. This is your year, remember. So take the steps to show life you mean it. P.S. 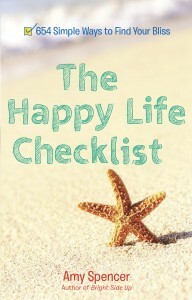 If you’re enjoying this positive, proactive approach to life, order your copy of The Happy Life Checklist so you can keep the challenge going all year long. Because the way I see it, life isn’t just about the big goals ahead of you, it’s also about the small, beautiful things you can stop and savor right now. And those happy moments are all around you. Remember: Happiness comes in the seconds and minutes of life, as well as in the years. So keep on living, loving and celebrating the small things that make life worth it.